These Bacon Wrapped Shrimp are a super easy appetizer recipe which is a party favourite and can be made in no time. 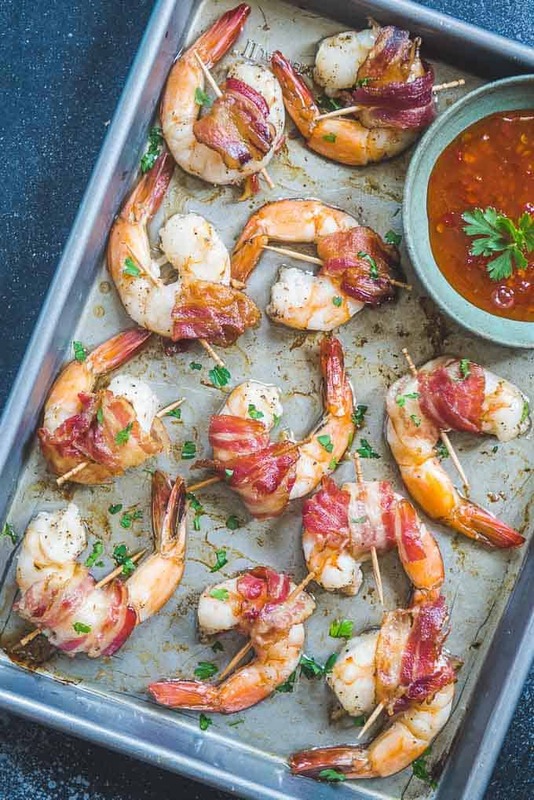 Crispy bacon wrapped over juicy shrimps makes these a crowd pleaser. 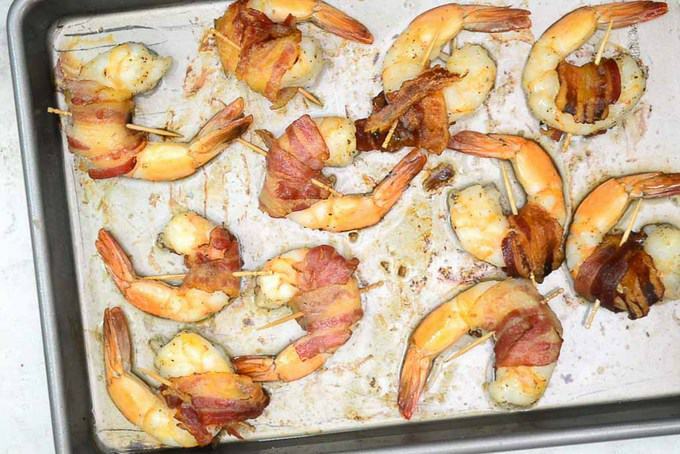 Here is how to make grilled shrimp wrapped in bacon. Only one thing comes to my mind when I think about bacon wrapped shrimps – crispy meets juicy. It is a crowd pleaser and easy to make. It is one appetiser that would love to make and your family or guests would love to eat. They are my go to appetiser when I have guests over. 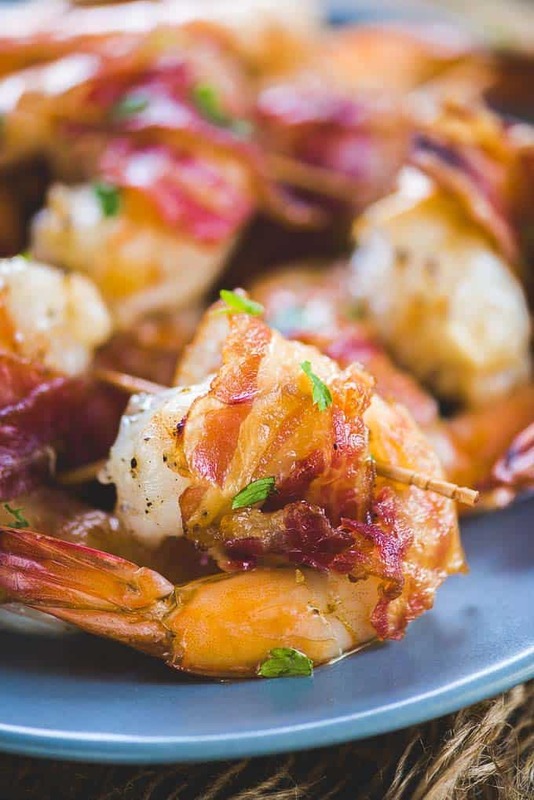 Crispy bacon, tender shrimp – what is not there to love! Cherry on the cake is the Olive Oil garlic or a caramelized brown sugar bourbon glaze. It is a blast of flavours in your mouth with sweet, salty, and spicy. How to make Bacon Wrapped Shrimps? It is an easy-to-make appetiser. Just wrap the shrimp in bacon. Rub or brush the glaze on it and then pan-grill, fry or bake in the oven. To get the perfectly crisp bacon and juicy shrimp, consider par-cook (cook half way) the bacon. This will get you the best results. Your final bite will be crispy and juicy. Bacon would be perfectly cooked until crisp and shrimp would be perfectly juicy and not overcooked. If you cook bacon and shrimp for the same amount of time, bacon might be perfect but shrimp would be overcooked. So make sure you par-cook the bacon before wrapping it on a shrimp. 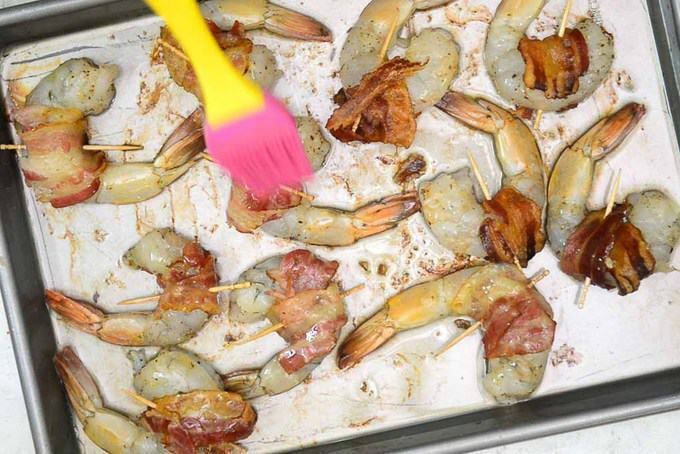 To secure the bacon on the shrimp, use a toothpick which has been soaked in water for 30 mins or more to avoid charring. 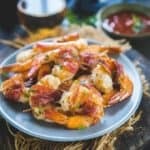 How to choose Shrimp for making Bacon Wrapped Shrimps? For bacon-wrapped shrimp, use jumbo shrimps, which will number 16-20 per pound. Jumbo shrimps are meaty and juicy. Make sure the shrimps are thick enough for the bacon to cook through and become crispy and shrimps are not overcooked. 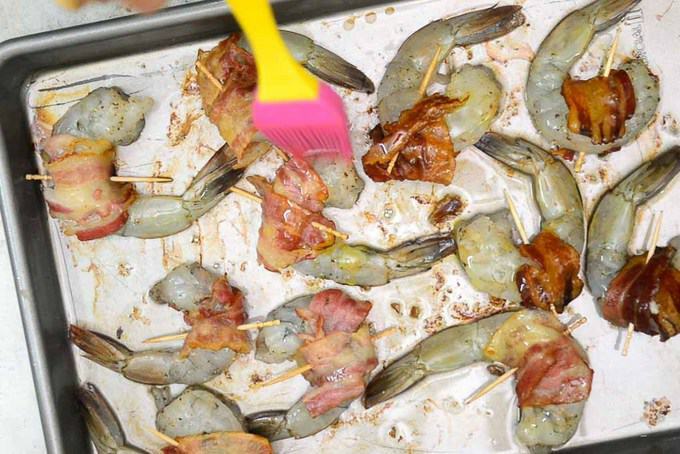 How to clean the Shrimp for making Bacon Wrapped Shrimps? 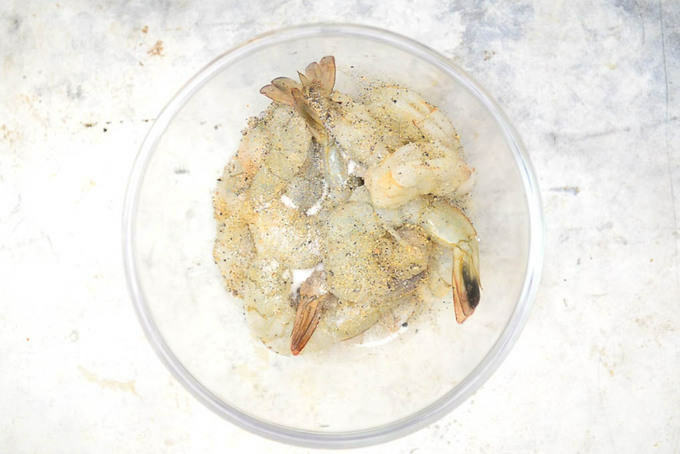 It is easy to clean and devein shrimps at home if you have bought raw shrimps with shell on. Using a paring knife or kitchen shears, make a shallow cut at the back and in the middle, from tip to tail. Peel the shell, leaving the tail on. Now just lift out the vein using the tip of the knife and discard it. You can also ask your fishmonger or vender to clean and peel the shell for you. You can check this video for a detailed instruction. What to serve with Bacon Wrapped Shrimps? 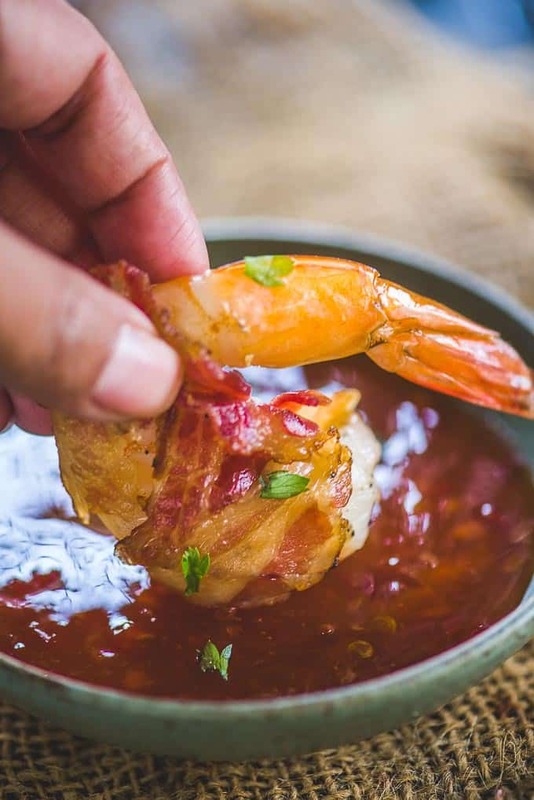 Serve your bacon wrapped shrimps with any cocktail sauce, chilli sauce, or BBQ sauce, and some lemon wedges. You can also serve it with a cheese dip or cream cheese or as is. There are many other glaze options, such as Garlic EVOO glaze, Honey glaze, and Thai chilli glaze with some Thai chilli and Thai fish sauce. You can also make cheese stuffed bacon wrapped shrimps. To make cheese stuffed bacon wrapped shrimps, create a slit along the back of the shrimp for the cheese stuffing using a knife. Place thin cheese sticks or pieces in the slit and wrap the shrimp with par-cooked bacon and secure with toothpicks. You can also stuff cream cheese in the slit instead of any hard cheese stick. Line on a baking tray and brush a little glaze on it. Bake for 5 minutes or until slightly golden. Remove from oven and spread honey on each piece. Then brush them again with the remaining glaze and bake for another 5-6 minutes until the bacon is crispy. Remove the shrimps from oven and serve hot. Can you make Bacon Wrapped Shrimp ahead of time? You can make bacon wrapped shrimps ahead of time and re-heat them in oven before serving, but it is advisable that you make them fresh. You can prepare the glaze beforehand and make them fresh. Can You Re-Heat Bacon Wrapped Shrimps? Yes, you reheat them in the microwave or broil them for a short time for 2-3 minutes. How to make sure Bacon Turns Crispy? 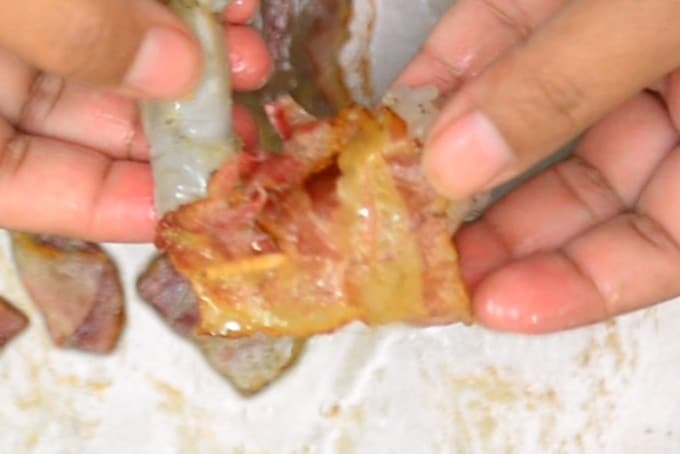 Par cook the bacon until it’s half done and then wrap it over the shrimps and secure with toothpicks soaked in water to get the perfectly crisp bacon. How to make Pan Fried Bacon Wrapped Shrimps? You can also fry bacon wrapped shrimps. 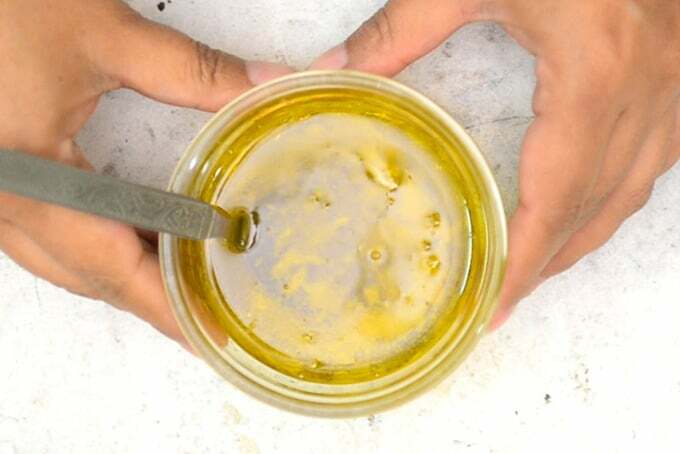 Heat oil in a deep-fryer or large saucepan to 350 degrees F (175 degrees C). Cook the bacon wrapped shrimps in the hot oil in batches until the bacon is crispy and golden brown for 2 to 3 minutes. Drain on a paper towel to remove extra oil before serving. Pre heat the oven to 400 Degrees f (200 Degrees C). Arrange the bacon slices on the sheet in a single layer and bake for 10 minutes. 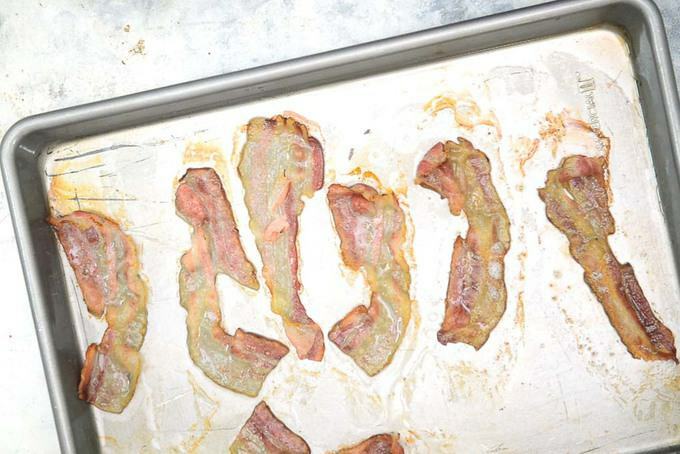 Remove the baking sheet from the oven and let the bacon cool down a bit. Season the shrimps with salt and pepper and wrap half of the par cooked bacon slices over each shrimp. Secure the bacon over the shrimp using a toothpick. Arrange the prepared shrimps of the baking sheet and brush with some of the glaze. Bake the shrimps for 5 minutes. Then brush them again with the remaining glaze and bake for another 5-6 minutes until the bacon is crispy. 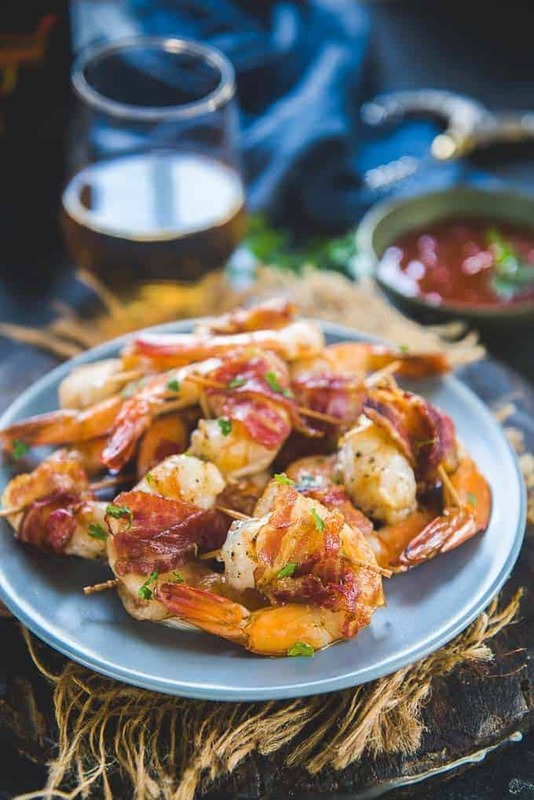 These Bacon Wrapped Shrimp are a super easy appetizer recipe which are a party favourite and can be made in no time. 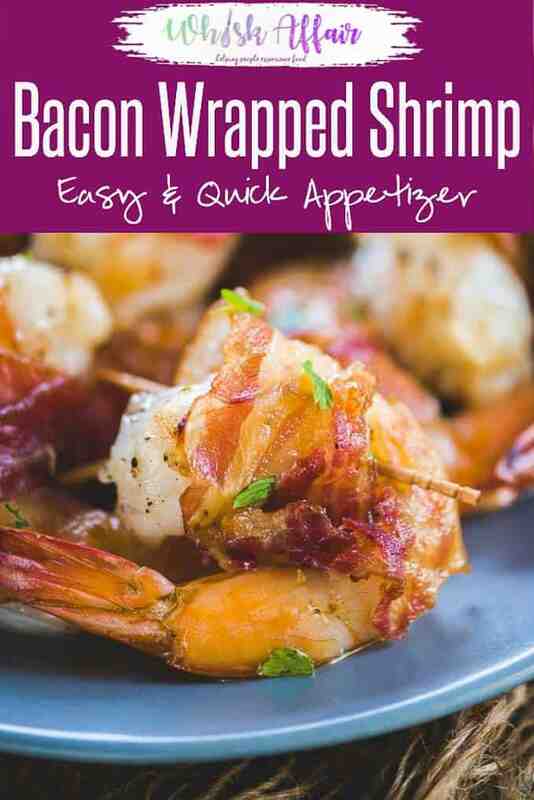 Crispy bacon wrapped over juicy shrimps makes these a crowd pleaser. 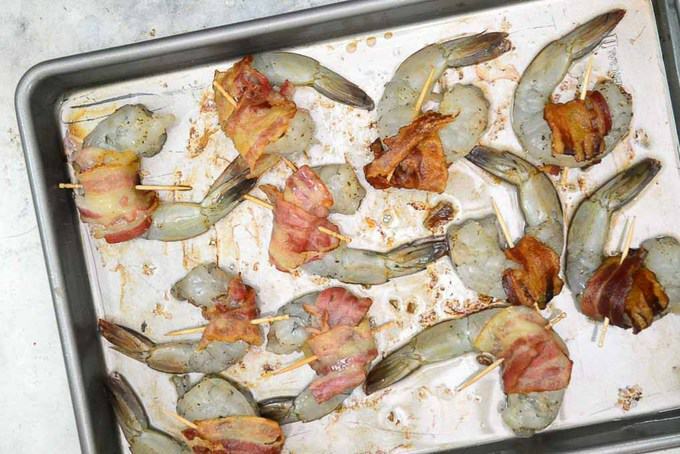 Here is how to make grilled shrimp wrapped in bacon. Pre heat the oven to 400 Degrees F (200 Degrees C). 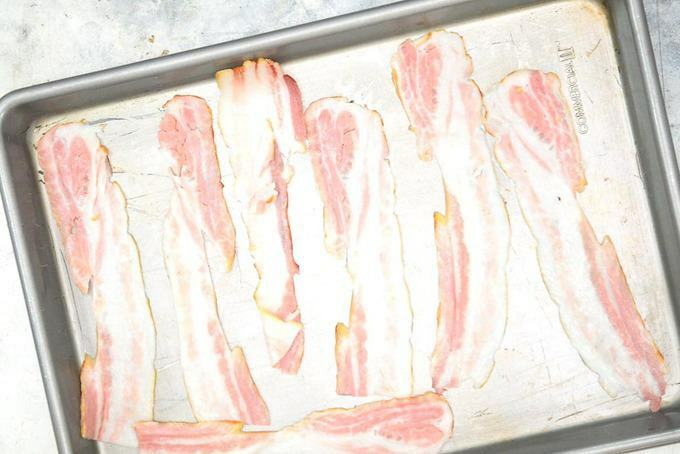 Arrange the bacon slices on the sheet in a single layer and bake for 10 minutes. Arrange the prepared shrimps of the baking sheet and brush with some of the glaze. Bake the shrimps for 5 minutes. Remove the shrimps from the oven and serve hot.